Nintendo’s announcement earlier in the year that Sky 3D was to provide video content for the Nintendo 3DS was met rather positively. That partnership has this week provided the first product of its initial fruition, with a new ‘Meerkats 3D’ trailer available to be viewed through the free Nintendo Video application. It’s a mischievous trailer that is used to promote Sky’s new wildlife show of the same name, which is due to debut this Sunday on the core Sky 3D channel. 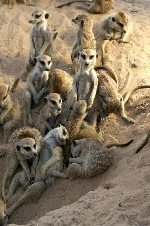 The Meerkats 3D trailer is available to view until October 19th 2011.